Love old school punk? 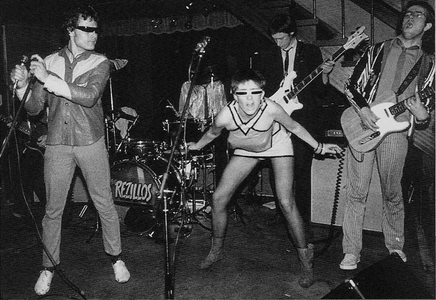 Then you can’t miss punk/new wave legends The Rezillos, who take to the stage at This Ain’t Hollywood on Friday, November 23/12. The Rezillos burst forth upon the rock scene in 1976, having gathered together at Edinburgh College of Art. Through a shared love of Sixties Garage Rock and the Spectoresque Girl Group glam of The Ronettes and the Shangri Las, The Rezillos found themselves inadvertently caught up in the Punk or New Wave movement. Their debut single, “I Can’t Stand My Baby”, shot them to underground fame initially via airings on John Peel’s radio show. Their classic singles “My Baby Does Good Sculptures”, “Top of the Pops” and “Destination Venus” signalled critically acclaimed milestones for the band. Their landmark album of 1978 “Can’t Stand the Rezillos” reached the top 10 in the UK album chart. They appeared twice on the legendary Old Grey Whistle Test and hit the Top Twenty with their hit single ‘Top of the Pops’, a satirical swipe at the UK pop music programme of the same name. Once the band had achieved chart success it was inevitable that they should appear on the same show! They followed up that same year with a live recording, “Mission Accomplished… But the Beat Goes On”, and promptly broke up to the anguish of fans and music critics alike. buzz via the internet, etc. Bringing it to a head, they reformed on New Year’s Eve 2002 with a spur-of-the moment gig in Edinburgh, Scotland playing to 150,000 Hogmanay revellers gathered in the capital city. Following rave reviews, the reformed group embarked upon a twelve-date tour of the US. Strangely enough, although signed to an American label, and having recorded their debut in New York City, the band had previously played only one gig in the USA in 1978, at the infamous CBGBs. They played exceptional sell-out shows in Norway and France and won over a new generation of Spanish fans in Madrid, Barcelona and Valencia. In March 2003, the long-awaited cult-movie, Jackass: The Movie was finally released in the UK. The Rezillos classic foot stomper “Somebody’s Gonna Get Their Head Kicked In Tonight” features on the soundtrack, and resulted in them appearing in no less than five US publications on the same day on the first week of it’s US release. Tickets: $22.60, available at TAH, or via their site.